“After robbing the bank, a plane took the thief to the Bahamas.” So the plane robbed a bank? “As a law-abiding citizen, red lights never get run when I’m around.” Red lights are law-abiding citizens? “The stranger in the ugly coat I honked at turned out to be my traffic court judge, so I later regretted being rude.” She honked at the ugly coat? 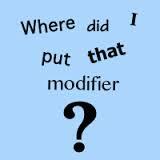 If you find some misplaced modifiers in your writing, send them in to the comments. Examples are fun.